I'll be back on my toes with more nail art soon. 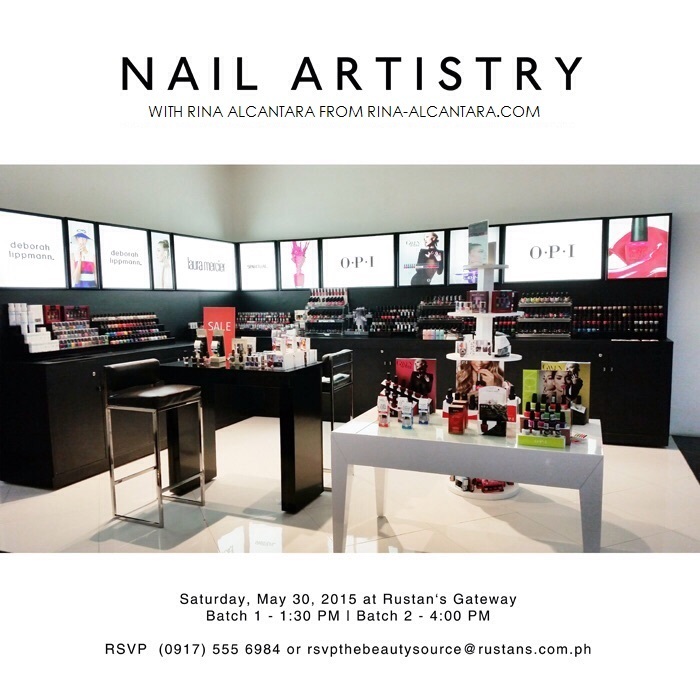 But today, I'd like to invite you to come join me for a nail art workshop that's happening this Saturday, 30th of May 2015 at Rustan's Gateway Mall, Cubao, Quezon City, Philippines. I will be sharing a few tricks up my sleeves on how to create different nail art looks with the sponging technique. It would be simple, inspirational, and fun we'd definitely have a lot of fun! Participants will have a vast variety of nail polishes to play with courtesy of OPI and Deborah Lippmann by Rustan's Beauty Store. It will be a one day event with 2 batches so we can accommodate more nail art enthusiasts. The first batch will start at 1:30pm and the second at 4:00pm. I'm actually excited to meet you all and talk nails this weekend so make sure you RSVP to the invite either at +63.917.5556984 or rsvpthebeautysource@rustans.com.ph. I wish I was going to be in the Philippines, let alone the right area, just to learn that galaxy mani technique. Unfortunately, I'll be home in Sacramento, California. I hope the event goes wonderfully though! Can't wait to see more of you! I've missed you terribly. Hope all is well and that the event was a huge success.